KE00050 is a solid phase sandwich Enzyme Linked-Immuno-Sorbent Assay (Sandwich ELISA). 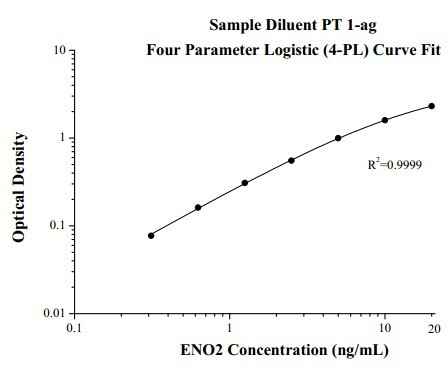 The ENO2 ELISA kit is to be used to detect and quantify protein levels of endogenous ENO2. The assay recognizes human ENO2. A polyclonal antibody specific for ENO2 has been pre-coated onto the microwells. 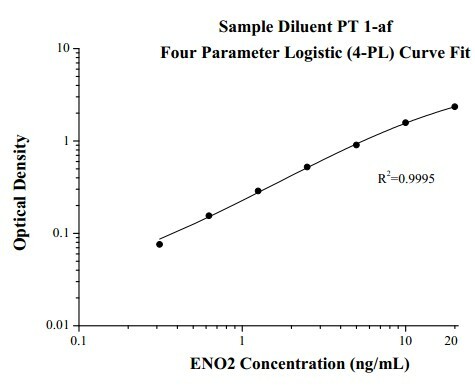 The ENO2 protein in samples is captured by the coated antibody after incubation. Following extensive washing, a monoclonal antibody specific for ENO2 is added to detect the captured ENO2 protein. For signal development, horseradish peroxidase (HRP)-conjugated Anti-mouse antibody is added, followed by Tetramethyl-benzidine (TMB) reagent. Solution containing sulfuric acid is used to stop color development and the color intensity which is proportional to the quantity of bound protein is measurable at 450nm with the correction wavelength set at 630 nm. ENO2, also named as Enolases are cytoplasmic glycolytic enzymes that may be involved in differentiation. The enolase has three isoenzymes, alpha, beta and gamma. The alpha form is expressed in most tissues, whereas the beta form is expressed in muscle tissue. The gamma enolase (ENO2), particularly isoform neuron-specific enolase (NSE), a homodimer, is primarily localized in neurons and neuroendocrine cells and is a cancer diagnostic marker for brain tumors. ENO2 plays a role in the glycolysis-related energy pathway and might be involved in higher metabolic activity during the day than at night, at least in part. Gamma-enolase predicts lung damage in severe acute pancreatitis-induced acute lung injury.